Manatee Springs S.P., Levy County, Fla.
Scammed by my own HVAC repair company! 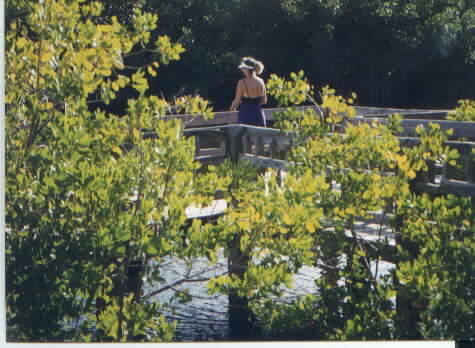 A Hillsborough County Park - VERY nice! It is located on Tampa Bay, northwest of Ruskin on 19 Avenue, 2 miles west of US 41. This is a 500 acre park with canal access on every campsite. The canals all lead into Tampa bay. 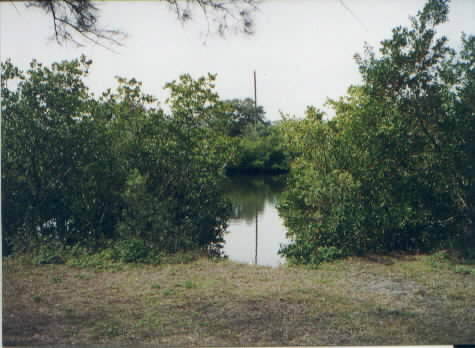 It is dominted by Mangrove trees, has a beach and a boat launch. It has 60 campsites with water and electricity. Little to no shade but the waterfront location of each and every campsite is a real plus. We were able to fish from the banks of our campsite and several docks in picnic areas. 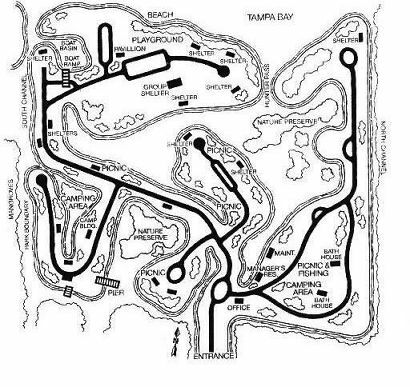 Definitely a park worth visiting. 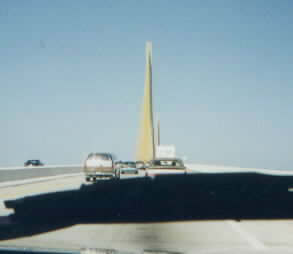 The Skyway Bridge over Tampa Bay. Beautiful to behold for most. I have bridgephobia. It didn't seem to be TOO scary from here....but it sure was long - and scary. Our campsite before setup. Not much shade or privacy - but the canal access in the rear was fantastic. Besides, it gave us a chance to meet the neighbors as they moved in. One of them had a collapsable boat! Hmmmm. The seed of an idea - perhaps we need a small portable watercraft for our camp trips? Maybe....a small canoe? This is a very pretty park with one of the beach areas right on Tampa Bay. Our Canal Access. We fished from the bank here. Caught a few catfish with bacon because the racoons ate our live shrimp bait for midnight snack the night before. Those dern racoons are everywhere it seems. Now, the food, the trash and the bait all spend the night indoors with us! 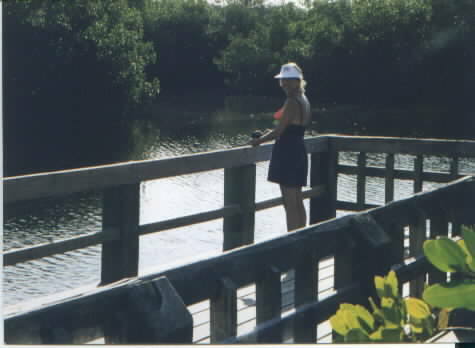 This pier down at the Pavilion offered some nice fishing and a beautiful view of the saltwater canals that run throughout the park. We caught catfish and sheephead and sea trout. What looks like the Washington Monument is actually the road in front of us. GULP! I closed my eyes and prayed us over it. Dave says the view was fantastic. I wouldn't know. Janie Sez....our new popup camper makes set up easy, but with all the open-ness of a tent. The perfect combo for us! Dave's sporting battery operated, hands-free, headlights to work on his crossword puzzle. 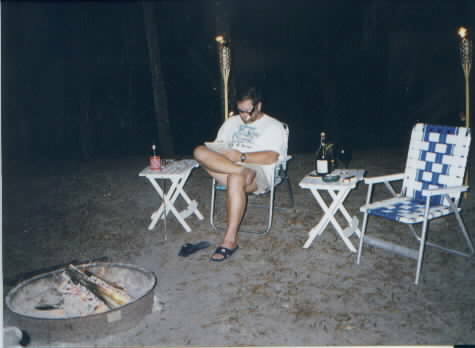 With the campfire to boot, the evening entertainment never ends!